3.9 GPA. HAS DESIRE TO ATTEND COLLEGE PREPARATORY SCHOOL. ACADEMIC INTEREST IN MEDICINE. HAS BEEN A MEMBER OF REACT, DRUG FREE, COMMUNITY SERVICE CLUB SINCE 2013. HAS EDUCATED PEERS ON THE DANGERS OF MARIJUANA USE. MENTORS YOUNGER STUDENTS IN LEADERSHIP, COMMUNITY SERVICE AND DRUG PREVENTION. VOLUNTEERS ANNUALLY AT “CHRISTMAS IN CLINTON”. STARTING PITCHER AT JARED ELIOT IN BOTH 2017 AND 2018. AWARDED “OUTSTANDING PERFORMANCE” IN 2018. OTHER INTERESTS INCLUDE WOODWORKING, PAINTING, MEMBER OF CREATIVE TEAM FOR SCHOOL PLAY SET DEVELOPMENT. THE BUZZ: KACEY HAS BEEN A STANDOUT STING PLAYER SINCE 2016. EVEN AT A YOUNG AGE, SHE IS A TRUE POWER, “STRIKE-OUT” PITCHER. SHE THROWS A POWERFUL FAST BALL, NEARING MID-50 MPH. SHE MIXES A CHANGE UP AND A DROP. AT THE PLATE, SHE HITS WITH CONSISTENT CONTACT AND POWER. SHE CAN CHALLENGE ANY FENCE AND REGULARLY DRIVES THE BALL INTO THE GAP. SHE HAS GREAT SPEED HOME-TO-FIRST AND IS A THREAT TO STEAL ANY TIME SHE’S ON BASE. 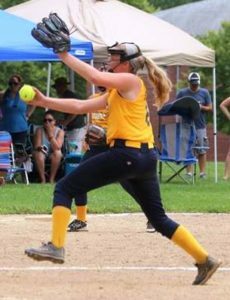 IN THE CIRCLE, SHE BECOMES A FIFTH INFIELDER WITH A QUICK GLOVE AND GOOD DECISION MAKING. AT THIRD BASE SHE FEATURES HER QUICK GLOVE AND A VERY STRONG AND ACCURATE ARM. KACEY WILL BE AN ASSET TO ANY SCHOLASTIC TEAM.